Old map by FRIES -Orbis typus universalis iuxta hydrographorum traditionem.. 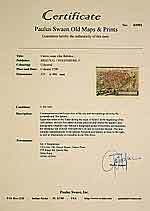 Title: Orbis typus universalis iuxta hydrographorum traditionem.. Size: 12.4 x 18.9 inches. Condition: Very fine condition. On verso some minor reinforcements along the center fold due to some paper thinness. Very good original margins. One of the earliest world maps that collectors can still obtain and probably the earliest delineation with the name America on it of similar obtainability. It has long been famous as the first use of the name America in an edition of Ptolemy. 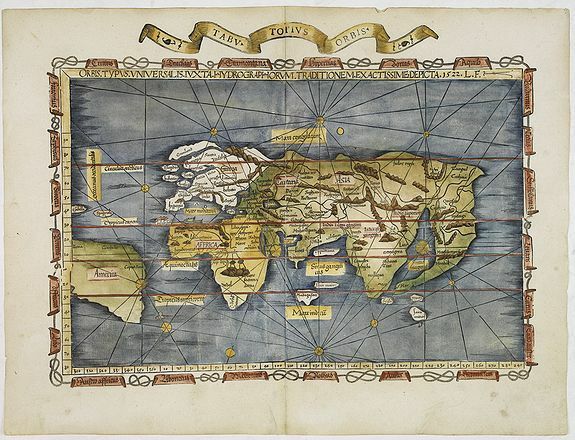 This modern world map was Fries's own contribution to the 1522 Strasbourg Ptolemy, most of the maps of which were copied from the Waldseemüller blocks of 1513. Shirley describes its retrogressive faults, e.g., the previously well defined Indian subcontinent has become a confusing double peninsula. Europe is very crudely drawn with England and Scotland reverting to separate islands. South America is shown in part, with the shape of its western coastline inserted more by intuition than by factual report. Magellan had indeed reached the Pacific via Tierra del Fuego in 1519 but his surviving ship did not reach the ports of Europe until September 1522, several months after publication of Fries' work. In spite of these imperfections Fries' map is much sought after as it somehow reflects the ambiguities of his age. A framework of mediaeval thinking is having to be re-cast in order to accept the as yet unrealized extent of the newly conquered lands. Published by M. Servetus in Vienne in 1541.